Here is the latest article from Grazia Australia about Nicole Richie. I don't think this story is factual as they use the usual 'friend' in the story and they discuss anorexia and since Nicole Richie has stated she never had anorexia i take this story with a pinch of salt, because although it is a positive story it may not necessarily be true. Launching a body-image campaign, a TV show and a boho-tastic clothing line are all in the pipeline for 2010… Phew! 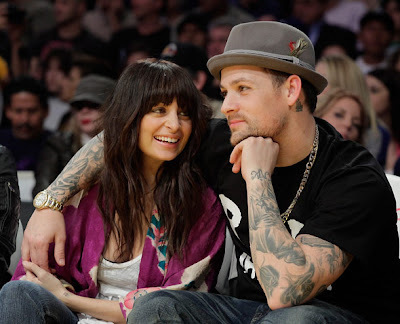 Even by her standards, 2009 was a rollercoaster year for Nicole Richie. She was devastated by the death of her godfather and close friend Michael Jackson, as well as the tragic loss of her ex-boyfriend, DJ AM, from a drugs overdose. But Nicole, 28, was also elated when she became pregnant for the second time – Sparrow was born in September – and her fashion and jewellery lines have been a roaring success. After being hospitalised with a serious bout of pneumonia just weeks before Christmas, she’s battled back to health and is determined to make 2010 a year to remember – for all the right reasons. “Nicole went from the depths of grief to highs of joy last year,” says a friend. “She has been through so much but she’s coped with everything that’s been thrown at her and has come out of it stronger, happier and healthier. “She says she feels like a brand new woman after having Sparrow, losing weight healthily and getting her career on track. While her father, Lionel, babysat their children in a Las Vegas hotel, Nicole and husband Joel Madden hosted a huge New Year’s Eve party at the nearby Lava Lounge bar. Clearly happy with her new brunette hair and post-baby body, Nicole wore what she called a “glitter-ific” dress for the occasion. But far from going back to her former wild ways, she spent the evening sipping mineral water (she’s still breastfeeding). And with the party over, she’s immediately embarking on a hectic work schedule. Top of her to-do list is an issue close to her heart: eating disorders, particularly anorexia. She and Joel have set up a charitable foundation for children but Nicole now wants to spearhead a campaign about healthy body image aimed at teenagers. She has talked to health experts about setting up a project where former sufferers like herself will go into LA schools and act as “big sister” mentors to at-risk girls.